As I recover from chemotherapy and regain my humanity, it’s been interesting to watch my hair return. Chemotherapy seemed to induce a reverse puberty in terms of body hair, as places like my arm pits suffered greater and more complete hair-loss than my head did. When I see pictures of myself shirtless from any time before chemo, I wonder who that great ape is with the hairy chest and why he has my nose. The regrowth of my eyebrows in the past few weeks has been particularly cheering to me, as that was the only change that I actively disliked. It’s quite a relief to no longer look like a deranged psychopath when I’m smiling—or at least a deranged psychopath without eyebrows. But back to my beard. That’s really why you came, isn’t it? In an act of protest and laziness, I let my beard grow out shortly after I began chemo, so my facial hair was my first tipoff that chemotherapeutic autumn had begun and leaves were beginning to fall. I still remember being at the bathroom sink and scratching an itch on my cheek. When I looked down, I saw that tons of small red hairs (I’m a secret ginger beard!) had been sprinkled into the sink. When I looked up into the mirror, my reflection showed a patch of beard on my cheek that was much less full than it had been a moment earlier. When these beard hairs started falling out more ferociously, I decided to ditch the beard and ultimately the remaining hair on top of my head as well. As I mentioned here and in my previous post about beards, laziness is often a huge motivating factor in letting my beard grow out. I don’t mind the act of shaving when I’m doing it, but I sometimes lack the willpower to start the process, especially early on a weekday morning before work. One of the joys of working from home and basically being perpetually stuck to my couch was that I didn’t get out much and really didn’t need to worry about being clean-shaven. (Sorry, Theresa.) That said, I soon noticed that some areas of my face were clean-shaven, without my taking a razor to them. The goatee area—under my nose, around my mouth and across my chin—were rendered completely hairless by the chemotherapy! It was actually pretty wonderful. With my diminished beard production and a lack of scratchy mustache, I could (and did) go a month without shaving my face and not even look that unkempt. I could blow my nose without tissue particles getting stuck to the tiny hairs on my prickly face. My once permanently shadowed upper lip had become the smooth upper lip of a first grader. It was a closer shave than even the most expensive razor or skilled barber could provide. I reveled in it. As for my upper lip, the regrowth looked exactly like what I experienced the first time it had grown in. When we were younger, my brothers and I coined the term Bad 8th Grade Moustache™ to refer to the curtains of wispy facial hair that first grew at the edges of a 13-year-old’s mouth and slowly enveloped the upper lip until there is an off-putting ghost of a mustache hanging above the pre-teen’s mouth. For the second time in my life, I had a bad 8th grade mustache. On the few occasions that I have grown a full beard, I’ve been rather proud of how full it is in all its reddish glory, but I’ve never been overly impressed with my follicles’ attempts at a mustache. It’s technically there, but your eyes and brain fill in a lot of the missing details it is lacking to truly qualify as a full-on ‘stache. But now it’s a whole different ballgame. Second puberty has been inordinately kind to me. I am no longer able to shave my upper lip to the clean levels that I could before—even after shaving it remains somewhat darkened by the spectre of the hair that was there. It also grows back ridiculously fast by my face’s standards. If I shave on a Tuesday, I now need to shave again by Thursday. I was a once-a-week kind of guy before chemo, but I guess now I’m a man. Well, you did it. 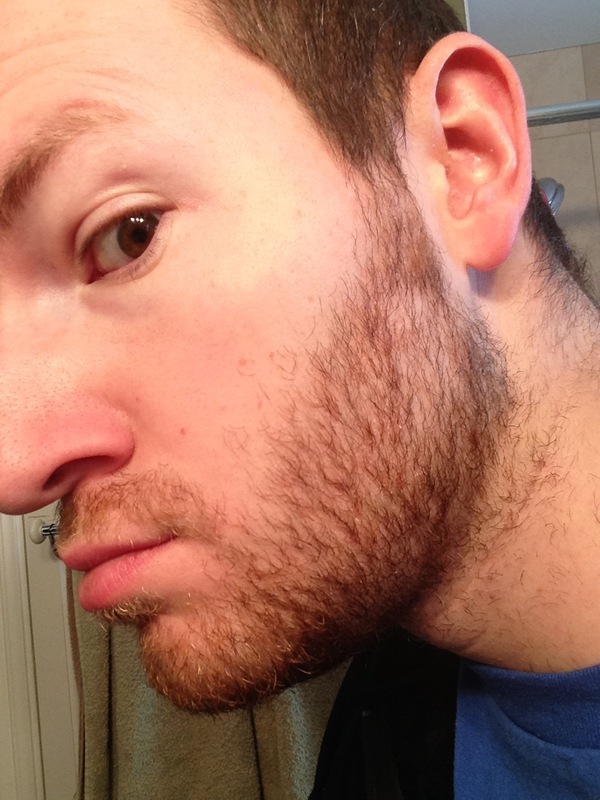 You read through a second blog post devoted entirely to my beard. Google and my blog statistics thank you. Be sure you subscribe so you can stay tuned for future updates when I start to go gray or decide that my newfound mustache superpowers would make a handlebar mustache a realistic possibility. Who would have thought beards were such a hot topic? Laughed at your “Mustache” comment. off to read some more. Gotta love the slow and steady return to normalcy! When your beard first started growing in after chemo, what color did it originally take? Its been three weeks since my last dose of vincristine, and my once-red beard is growing in black (though there are a few small patches of red). Most of my beard is fairly thin, but the musstache is coming in a fierce black. My facial hair stayed the same reddish color, but my mustache grew back thicker than ever. I have heard of people’s hair coming back in different colors after chemo or being wavy/straight when it wasn’t before. All just part of the grand mystery of chemo side effects! Congrats on finishing…Hope you’re doing well and in good health!